Crowd-sourced, agile, thoughtful leadership. Redefining educational leadership as a process of ongoing learning, risk-taking & innovation. Empowering others to make a difference in the world & express their creative voice. Having FUN along the way. Below is my graduation speech for the Union Middle School class of 2015. This speech was different from my previous two graduation speeches in that I struggled to find the right words that I wanted to say to this class. It was actually at their Promotion Party a week prior where I sequestered myself in my office for a total of 90 minutes and just started typing. By 11 pm, long after I'd sent home our 8th grade students with their parents after three hours of candy, dancing, and Foosball, the graduation speech was 99% complete. My wife, as a middle school counselor herself, provided a few key additional lines and it was done. During the dozens of times I practiced this speech, I only once choked up. It was during the last segment of the speech during the story time. At the promotion ceremony, in front of a crowd of students, parents, staff, and community members, I felt my throat closing at multiple points. At the mention of our families fertility struggles. At the story of the student and his journey. And at the end. This has been such an interesting class of students. There is so much potential within them. I'm hopeful they continue to make us proud. Thank you parents for your support over the past three years. Thank you staff for your continued dedication to our students. And thank you students for just being you. Here is the graduation speech. Enjoy. 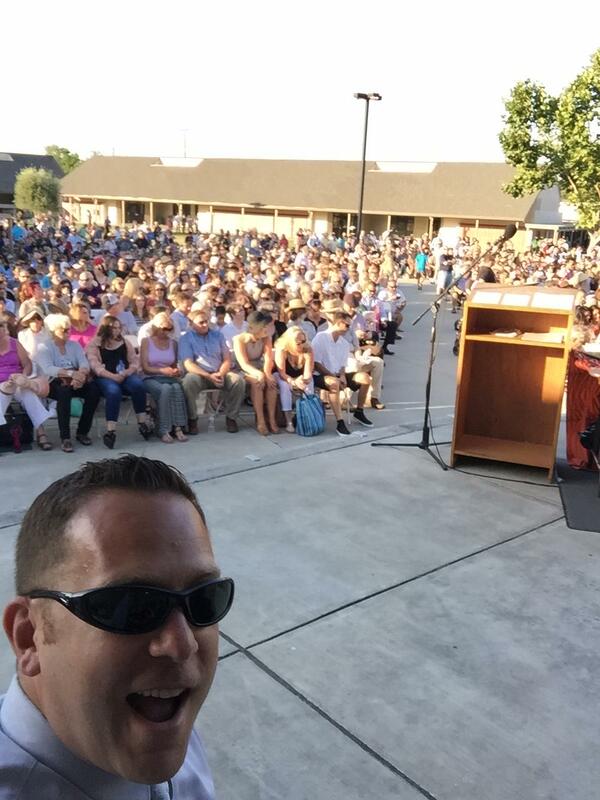 Good evening everyone once more to our 8th grade promotion ceremony. My name is Todd Feinberg, and I have been privileged to have been the principal of Union Middle School for the past three years. And what a three years it has been. Look at these 297 eighth graders bound for the foreign land we call high school. It is a talented, kind, considerate, and sometimes forgetful group of former mischievous little 6th graders that we as a community have molded into the young adults who sit before us all. It is a challenging group to speak to. They are diverse. They are unique. And they are quite special to all of us. Students… I struggled in writing this speech. It’s true… I couldn’t find the words I wanted to share each of you during these last few moments. After all, in less than thirty three minutes, you will have officially promoted from Union Middle and be 9 short weeks from starting all over again, this time as freshmen in high school. We don’t have that much time together and there is a lot I want to say. And so I would like to share the words I wish my own middle school principal had said to me during my own middle school promotion ceremony when I was 14 and thought like many of you, that I already knew everything I needed to know. I think my middle school principal would have encouraged me to try everything. Yes, I mean everything. Try everything in sports. Try everything in school. Try every educational, extracurricular, or athletic opportunity I could. We adults want you to be safe but we also want you to explore. We do. Sometimes, it just scares us what you will find, but that’s doesn’t mean we don’t want you to keep looking. And parents… yes, time to talk to the parents about your role here. You need to show your students that it is okay to take risks and it is okay to fail. It is not about perfection; if anything, we parents need to model our own imperfections so our students know that it is okay to try and not reach our goals on the first, second, third or even the millionth attempt. Try to discuss your own personal failures with your children. Let your children know that you have failed and that they too will fail. Let them know that this is okay. On a personal note, my wife and I tried to have children for the last 8 years. That’s eight years of doctor visits, eight years of start-stops, and eight years of tons of talk about giving up. Ten days ago, she delivered twin boys. This moment doesn’t happen without the previous eight years of struggles and the previous eight years of failures. I believe they would have encouraged me, like I am advising each of you, to be nicer. To our teachers. To our parents. To everyone. And most importantly, to ourselves. Students… you are good enough just how you are right now. None of you need to be taller, faster, skinnier, or bigger. You are all exactly how you should be. I cannot stress enough the importance of self acceptance and self compassion. We are not defined by our successes nor our failures. Nobody is perfect, so please don’t compare yourselves to others. From the outside, the student sitting across the room from you in Mrs. Jorgens’ 8th grade Language Arts classroom may look like everything is great but don’t be fooled. Everyone has their own personal struggles. Some just may hide their worries better than others. I would like to encourage all of you to be honest and to support one another. Remember: nobody is perfect. My former principal would have shared with me that everything from here on out will be a blur but that doesn't mean you have to spend your time taking pictures of these moments on a cell phone. Sometimes, your memory of the event is significantly more precious than one of the Instagram pictures you post for your six thousand followers. Just enjoy these days. Be in the moment. Help others have their moment. And I hope my former middle school principal would have shared a story. I do like stories. And in this story I’m about to share, many of you may know the names of the key individuals. Please know that the names aren’t necessarily important and the message I hope you take away could involve any one of us. About 16 months ago, an athletic 7th grader began to struggle. Things got worse…. things got very very scary for everyone… but eventually things got better. Along the troubling times, a Union Middle 7th grade science teacher went to the student’s house to work together on assigned classwork. Our school counselor met with the parents to help assist with their student’s transition back to Union Middle. His team of teachers made a commitment to give him whatever he and his family needed to be successful during his 8th grade school year. Our school community rallied around the family, providing support, a listening ear, and an occasional visit from Sharkie. The story now fast forwards to a week prior to the annual spirit game. A UMS basketball coach meets with the student and convinces him to join the 8th grade conference champion UMS basketball team for the spirit game. The morning of the game, the student is vomiting, almost too weak to stand. The night of the game, with Union Middle leading Dartmouth late in the 4th quarter, two UMS coaches, with full support from the UMS athletic director, call a timeout and create a play to get this student the ball, knowing that he would be fouled. Play resumes, the ball is in-bounded, the student gets fouled and he goes to the line to shoot two free throws. And the story could stop here. It doesn’t need to have a happy ending. Not every story does. Everything that has happened over the past fourteen months during this student’s journey is noteworthy and remarkable. The amount of support for this student from his classmates. The staff who reassured the family that they’d assist the student every step of the way. To the UMS boys basketball team who not only welcomed this student on to their team but were perhaps the most excited and loudest support group for him in the gym on this night. It’s already an amazing story. But this story doesn’t stop here… because we still have two free throws. In life, you will have free throws. You will be expected to perform and do something where you won’t have the strength to make it happen. You’ll try and you may fail. This was the first free throw on this night. It air-balled left. Everyone’s excitement for a special moment quickly turned to fear for what could have been a memory of embarrassment for this student. And that’s when I looked out at the free throw line and saw the student. A student who like many of you had struggled at some point during your middle school years. I looked at this student and expected to see someone ready to crumble. I expected to see someone ready to quit. I didn’t see any of this. Instead, it’s about what I heard. I heard laughter. This student, in front of hundreds of friends, students, parents, and community members, had the biggest smile on his face and just seemed content. The moment for him wasn’t necessarily about making the free throw; it seemed to be about everyone who managed to help him get to this moment. Every classmate. Every teacher. His parents. The community. Each and every one of you. He just laughed, happy to have the opportunity to shoot a free throw. I hope all of you have the chance to take your free throws one day. Don’t shy away from these opportunities. And even if you miss your first free throw, you just never know what can happen on your second shot. As we’ve seen, the ball may just bounce your way when you try again. So don’t give up. Don’t let each other give up. Just don’t ever give up. 2015 graduates. Thank you for being a part of my life over the past three years and thank you for being a part of each other’s journey. You have each brought something very unique and special to Union Middle School. You will be missed but we are quite excited to see where you lead us next. We’ll be watching, ready to support you along the way. Congratulations, Class of 2015. People reflect and write a lot about how much they love their #PLN. You can set up an IFTTT recipe to thank new followers on Twitter, the hashtag #FF is a popular tag on Fridays to recognize people you respect and want to acknowledge publicly for great contributions to your learning, and Twitter provides analytics that allow you to review and track reach and followers. All of this is great. And I know many people who are as data-driven in their personal lives as they are professionally. In this day of social media, if you want to grow in any field, you have to put yourself "out there". I understand that, and honestly, I work at it in spurts. There are many a night when you can find me marveling at the Google analytics for my blog. Hey, who doesn't like to see a new country pop up on your map of readership? But reach and data are not what I want to write about. For me, my #PLN has become something much more personal than Twitter feeds, G+ community members or LinkedIn connections. Over the past 18 months, my #PLN has become my greatest team of advocates and supporters, the ones who push me the hardest, the ones who celebrate my successes with me, the ones who point out my mistakes, the ones who collaborate with me. Yes, there are folks at my school site who fill many of these roles too, no doubt. But my core #PLN colleagues and friends have really ingrained themselves into my daily habits and endeared themselves to me as much more than Twitter handles and avatars-real or not. If it wasn't for my #PLN, I would be struggling as a second-year administrator to find support and solutions. Essentially, I would not be effective. A parent commented to me that on a scale of 1-10, our school is definitely a 10 in the arena of innovation. I was shocked by this feedback. I would put us at a 7-8. For her to say she views us as a "10" was amazing, inspiring, and gratifying! At some recent PD, our faculty led and shared for much of the time and I was so proud! To see other teachers stand in front of their peers and share their enthusiasm for a process or an app or a site was amazing. And many of these individuals wouldn't have dreamed of doing so just a year ago. We have an amazing teacher on our staff who is one of the five finalists for the Comcast Bay Area All Star Teacher Award (we find out July 8 who won). Her ability to be selected is completely because she is a rock-star teacher. But honestly, if it wasn't for my #PLN, I wouldn't have been able to write her nomination because I would have had no idea of just how amazing she really is in comparison to many teachers out there. This summer will be spent planning for next year. We have much to do and many new initiatives from this year need to continue, so support and follow-up need to be firmly put in place. But I look forward to this planning work because in looking back on this year, I see so much growth at our school site. It excites me to think of how much further we can go next year as we build on this year's successes and learn from this year's flops. And I know that my #PLN will be there every step of the way, questioning, sharing, guiding, pushing and cheering. I don't want you to see this post as "oh, look how great I am", because I have made LOTS of mistakes--this is a post from the fall that highlights a few of my mistakes, and believe me, I have made MANY more since then. Rather, I hope that you will see the benefits of creating your own #PLN, the benefits of putting yourself out there just a little bit more--or perhaps this blog post can be used to encourage one of your colleagues to get a little more connected. Regardless of your interpretation, I am proud of the fact that our school site is better because I--and many of our faculty--are connected. And I am not only proud, but extremely confident in knowing that we (the faculty and our collective #PLNs) are working together to ensure our students can have the best possible learning experiences at our school. In a variety of conversations with my #leadwild friends, there has been an explosion of discussion about student behaviors. Perhaps, it's because it's the end of the year. Some educators shy away from the word discipline. I checked out the meaning of the word, discipline. Discipline comes from and Ancient Greek word, Paideia, meaning nurture and upbringing. Discipline, or at least the word, brings up many childhood memories. Discipline means different things to different people. To me as a child, discipline was harsh, punitive. My teachers were losing their patience having to redirect an argumentative student over and over again. Getting sent to the office, was no more than a break for my teachers. I remember being an argumentative teen. My father and I were arguing over some arbitrary task or belief over dinner. My father warned me if I did not close my mouth, he would assign me standards to write, such as, I will learn to keep my mouth shut. It took a long time to learn that lesson, not standards, but to keep my mouth shut. Punitive. I ended up writing that standard for quite awhile. 5000 times. I know this time of year, I am running day and night. I come home and I figuratively bring my teachers and students to my home reviewing the day to think about what could be done better. Did the time out in the office help Jeff re-group and get back to class successfully? Did Sally choose not to argue with her teacher when asked to finish math? I reflect on discipline as a way to nurture, to teach. How can I help my teachers and staff see discipline differently? When I meet with students sent up to my office on a referral, it helps me to think of them as an individuals and find ways to nurture. I remember holding my son as a young parent. A nurse entered the room and told me that my boy was an individual, with his own personality and life. She reminded me that from now on I was wearing my heart on my sleeve. I reflect upon the idea of my son being an individual. As a school administrator, I'm encouraged to look at each child, the choices they make, their feelings, thoughts, and ideas and see a unique individual to nurture and guide. As my son who is 17 asserts his opinions, ideas and independence on me daily, I appreciate how students are growing and learning. It's part of the growth process. This week, I'm committed to finding ways to nurture and teach my students. The choices they make are their own, but I know I can influence and guide. 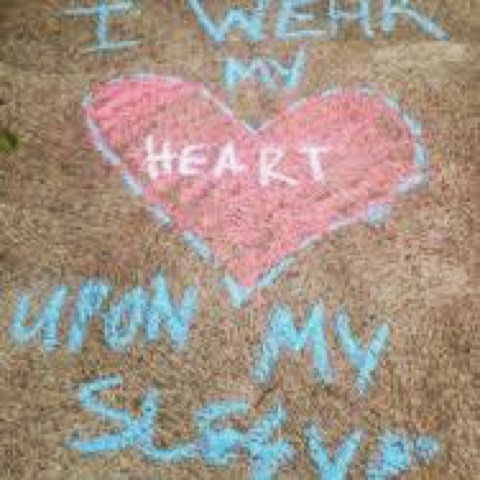 I care enough to wear the hearts of many children upon my sleeve. Voxer groups definitely get me thinking. Something about the almost-face-to-face quality of conversation. The almost-real-time of dialog. It's an amazing format for growth, reflection and discussion. One such interaction recently challenged our group to tell our #7wordstory. David Culberhouse got us started, "In Jeremy Gutsche's Exploiting Chaos he shares that people are remarkable better at remembering messages conveyed in 7 words or less... so, what are your 7 words? How do you convey your story in 7 words?" Rebecca Davis was quick with her response, "I jumped in and kept on swimming." And from there we got going. I hope others share their #7wordstory here. For me, I turn to the ocean. Immediately. For a myriad of reasons it is my place, my calm, my rejuvenation. Probably true for many people, my heart calms, my mind clears and my smile always returns at the ocean. It was a beautiful day with my two boys at Doran Beach near Bodega Bay. The three of us often trek out to dig a hole, take a walk or picnic. My husband hates the beach. He can't stand wind (too many years in North Dakota) and just won't risk it. Funny enough, we always score a beautiful day when we head out without him. Hhmmmm. So this photo was one such amazing beach day. My more contemplative son, Josh, starring out at the surf, barely wetting his feet. I love this picture of him. And the clouds.... oh my... there just aren't words. My work as a leader in education fits these three roles perfectly. When we're knee-deep in SBAC testing and people just need to feel safe and secure as we enter the known, I am a lifeboat. When students feel unsafe or shaky ground and I come alongside to reassure, problem solve and empower, I am a lifeboat. Buoys... they chart a path, mark boundaries, alert us to shallow water or danger... I do that too. And of course a sail. A sail is about movement, steering a course forward, taking a whole boat and crew in a direction, together. Who doesn't need a sturdy sail to keep the work positive, inspiring and motivating? I do that too. Is it always successful? No. Is it always in the right direction? No. But these are the roles I aspire to fill. I work hard every day to be better. It feels good to capture my story in this succinct, visual manner. Like a successful mission statement, it sticks. I believe it. I live it. And if I'm going with an ocean theme, no one wants to work with cement shoes or a tsunami. That would be a completely different blog post. Yikes. The art and science of teaching and learning. 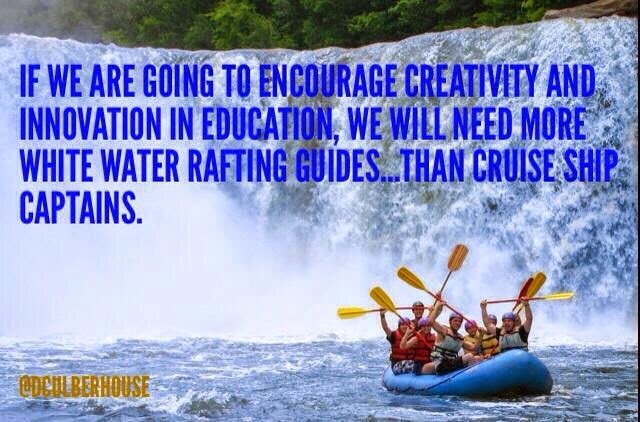 Is it creativity and collaboration? on the floor and under a table by a 7 year-old? by a first grade zoologist. Old school tools for future ready schools. on the work of kids and teachers. Yes. Leading wild means digging in and digging deep. It means never giving up. We may never arrive, but we are on a journey. Cross posted on Lead. Learn. Sparkle. I believe in movies. Some people say that everything you need to know is learned in kindergarten, but I disagree. Life’s most important lessons are found in sports movies. I have run a marathon, but I am not an athlete. I love sports, but I do not need to win. I can just see my daughter cringing when I say that. As the wife of a coach and the mom of a former collegiate softball player, sports have always been important to our family. And as an educator, I have often been struck by the parallels between teaching, learning, and coaching. What’s my favorite sports movie of all time? Major League-- and it’s no award winner. But I remember so many quotes from that movie and I love rooting for the Indians to win it all. As movies go, it’s kind of silly, but I love, love the scene where Charlie Sheen heads out to the mound. Watch the crowd. It gives me the chills. They are all in. Passionate. They believe. My favorite quote and one I remember the most? Attitude reflects leadership. When I think about the attitude of my students about school and learning, I believe that they were a mirror for me. The days I didn’t bring my best, I didn’t get their best. Every day, as a leader, I want to model the attitude that I’m hoping for with my team, whether it’s students in a classroom or teachers in my school. I want our students and teachers to be curious, willing to try and fail, and to be inspired. That’s what I’m hoping to bring every day. Am I always successful? No. But every single day I have that goal. Remember the Titans. I love learning. As often as I can, and as much as I can afford, I try to learn something new, whether it’s on Twitter, by reading a book, or attending a conference. In my first year as a principal, I sometimes get funny looks and even questions from teachers about this. “You’re here? You don’t have a classroom. Wow.” I get this a lot, or something like it. People are often surprised, but I need to be there. How can I lead learning in my school if I’m not a learner myself? I sometimes hear teachers say, “I can’t do that, I teach kindergarten” or something similar, but really, good teaching is good teaching. It’s our job as learners to make the connection to our life, to make the learning relevant. Today, I attended the Area 3 Writing Project Super Saturday session for 3rd-6th grade teachers about using conversation to improve student writing, and we started This I Believe writing. I’m already excited to see what our third grade team does with the idea, and we’re thinking of sharing this idea with our teachers next year. I couldn’t wait to get home and write this post! Who do I play for? I play for #teamlearning! Life is hard. There are mountains of obstacles blocking the path to success, but we can’t get discouraged. Every day, we may fail. We need to be willing to take risks, to have courage, to believe that the impossible can be achieved. This is the thing that gets me going every morning and keeps me awake at night, inspired by the possibilities if we just believe that anything is possible. We may fail, but we cannot lose. I believe in movies. Some people say that everything you need to know is learned in kindergarten, but I disagree. Life’s most important lessons are found in sports movies. Wild thing, you make my heart sing! Do you have a favorite quote or life lesson from a movie? I'd love to hear from you! This isn’t really the problem at East Leyden. You see it’s not necessarily the remembering of names but rather pronouncing of names. A little context: in a typical year we have over 32 languages that are spoken in our schools and in our students’ homes. As you can imagine these span the globe. Large groups of students who are 1st or 2nd generation from Mexico, Poland, Italy, Bulgaria, Ukraine, China, Syria, and many more. With these students come rich cultural traditions and heritage often coupled with a desire to continue to assimilate into American culture. Which brings us to names. Names like Avani, Xitlalli, Rohany, Najera, and Tautvydas. Our staff is extremely caring and driven to create positive relationships with students. Our students are respectful and kind. Often, because our staff is trying so hard and our students are so nice neither one wants to offend the other and names can be lost in the shuffle. I’ve been noticing this the past few years, specifically this time of year. 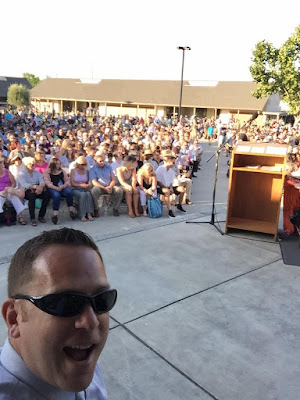 As every high school administrator knows, this is recognition season, whether it’s award ceremonies or graduation we are constantly announcing students, often in front of their parents and others. In these situations we strive to make sure the student’s name is honored and we pronounce it correctly. We will visit the students in class or call them down to our office and feverishly make phonetic notes. This has always seemed backwards to me, to take so much care in a name at the end of their high school career. The complexities of a large comprehensive high school don’t allow easy communication of things like the pronunciation of 1761 names across 125 teachers. Earlier this year, I came across a web-based application called Name Coach. The whole idea behind the website was exactly what I was looking for, a solution aimed at precisely what I identified as an issue for us at East Leyden. With this delightfully simple idea, students are sent a link to record their name; this recording then populates a spreadsheet which can be accessible by anyone who wants to pronounce the name as the student does. I was excited at the idea and tested it immediately with a small group of students. The interface on the student end was straightforward and allowed me on the back end to sort and share the list. This was the start of what I was looking for. The next step was going to take a willing tech department. Thankfully, with Bryan Weinert, we are fortunate to have a tech director that understands the importance of leveraging technology to enhance our school community. Bryan worked with another member of our tech team and East Leyden grad Gabe de Soto to work with the Name Coach team on not only using the application, but actually syncing this information with our student information system. The end result will be next fall, teachers will be able to select their class roster and arrive at a list of names with pictures and links to the students themselves pronouncing their names. We will be moving forward with using this solution for graduation this year, and then a full launch for all 1760 students in the fall. This may sound like a small thing, but recently Avani, pronounced Uv-nee, shared with one of her teachers that no one has ever pronounced her name correctly....since preschool. This came up during a discussion in class about Mary Shelley’s Frankenstein about the importance of the creature never being named. Avani didn’t want to trouble anyone by correcting them; she shouldn’t have to. When we can leverage such a simple idea with technology all of our teachers and students can benefit. Looking to connect with other wild leaders? Seeking rafters to join our #leadwild crew. Have a great post to share? 2. The subject line is your blog title. 3. The body will be your post.